In eight days we are going to here Cisco’s full year FY11 and Q4 FY11 report. Prior to their Q3 FY11 results I wrote about how important Cisco’s report is for the technology industry. All the signs that CSCO had lost their way came true in the Q3 report. What should we expect next week? In the August report, CSCO is going to be the first technology company to tell us about July and they should guide FY12. If they do not guide for the full year FY12, that is a red flag. If they talk about visibility being limited, hard to define macro, and at this time only guide Q1 FY12, then red flags all around. Public sector is a big piece of Cisco’s business so we want to see this number and hear about trends. A few other data points to look at (1) margins, is the company discounting to protect/gain share (2) commentary from John Chambers on spending dispositions from CEOs. I am looking for additional data points around slowing CAPEX which I posted here and here before JNPR confirmed with their results. 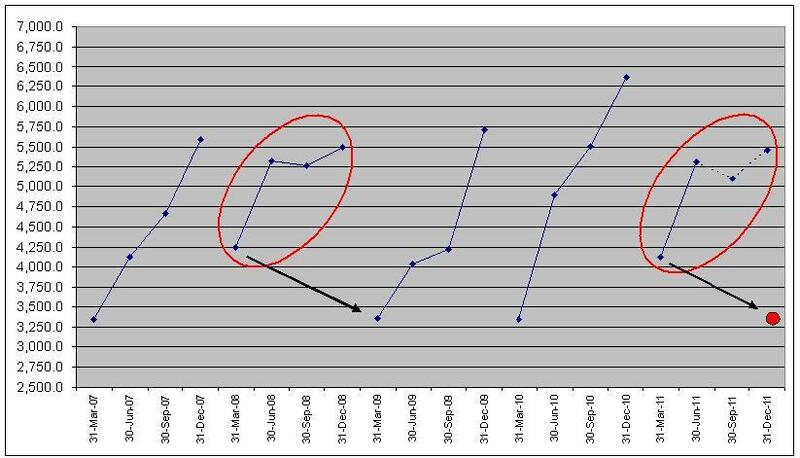 Here are two charts over the same period for JNPR and CSCO, which spans the market bottom in March 2009 till today. CSCO benefitted first from post credit crisis catch up spend, but JNPR had a longer duration uplift driven from positive product cycles against CSCO. 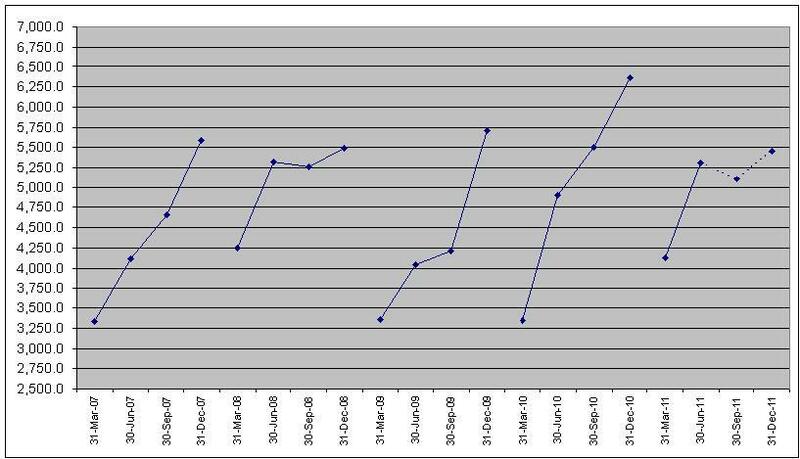 As JNPR enters the market slowdown in 2011, do they enter into negative product cycles as CSCO refreshes product lines? CSCO issued five consecutive disappointing reports starting in May 2010. JNPR’s July 2011 report is really their second disappointing report. How many are left? Another description would be if you think network deployment strategies are changing and the inflection point of another long and sustained network build out occurs in the 1H of 2012, then you need to be pretty far down the product/solution development effort path. It is August 2011, which means it is really September because everyone is on vacation. If you want to start selling solutions and deploying solutions in the 1H of 2012, you need be aggressively moving on the plan of record (POR). You have about five months to get product development efforts complete enough to sell and position in your key accounts. What I am going to be looking for at industry conferences over the next few months is evidence that the legacy Moore’s Law companies have realized there is a change and they are now trying to skate to where the puck will be, but I suspect I will find no evidence of this and they will be focused on skating to where they want the puck to be. Game is on. I will update this post in the morning, but we have JNPR up after the close. I posted a copy of my JNPR chart below. This is a pretty big earnings event for JNPR coming after the mid-quarter sell-off. The stock is below all the key MAs (50, 150 and 200). It is basically trading on the 20MA and above the 600MA. If you are JNPR long, you need to be adding to your position at this level hoping that stock reacts positively after the report thinking that instead of selling off after the report, the leadership team induced a pre-report sell off without pre-announcing. If the leadership team guides lower and the stock breaks the 600MA that would be a problem. GM guidance will matter. Stock continues to hold the trend line from the March 2009 low. I think a beat and raise would get the stock to $34, but a lower guide and this stock will see $25. I just spent some time reading through ERIC and T notes, but before I detail some thoughts on CAPEX a quick comment on FFIV which I wrote about on June 23. To me it looks like an EPS beat on tax and the growth rate is contracting ~400-500bps Q/Q. That is not a good trend for a high multiple stock. FFIV is a great company, but going forward they will have a lower multiple. It is not the end of the world, just the way things work. On to ATT CAPEX and I have already seen five notes telling me about a lagging indicator which is the Q2 CAPEX number from ATT. All of these notes took the ATT CAPEX number as positive indicator for several networking infrastructure stocks. A few months back we had CIEN report and then comments from the JNPR CEO and today we had no information from ERIC which always makes investors happier so what should a person make out of the big quarterly CAPEX print of $5.35B from ATT – yet the less than bullish comments from optical and routing/switching companies? Here is a chart that shows the quarterly CAPEX profile for T from 2007 through the end of 2011 and I estimated 2011 Q3/Q4 CAPEX based on commentary from the CFO that T would spend closer to $20B in CAPEX for 2011. T is an important indicator for the health of the economy as well as tech in general; just as WMT and FDX are important indicators for the US and global economies. On the surface the CAPEX print today combined with guidance seems bullish. 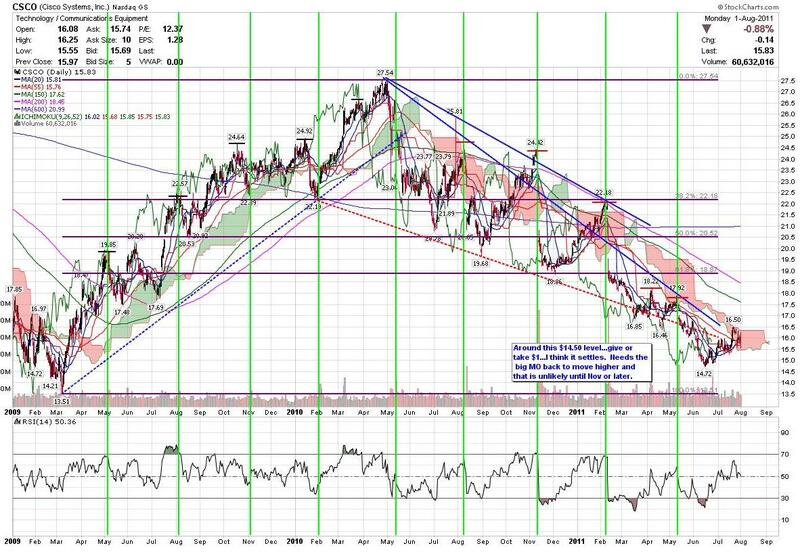 However, look at this second chart that I marked. Does 2011 look like 2008? As I stated before, I am not a big history repeats itself person, but there are some similarities between 2011 and 2008. 2008 was BSC then LEH, mortgage crisis and credit crisis meltdown. 2011 is Greece, Ireland, Spain, Portugal, Italy and the US debt ceiling talks. I am not worried about a US default. If that happens we have bigger problems, but I am concerned with Europe and the slowness of the US economy and the overnight numbers from China were not great. In August, we are going to hear from CSCO who will be the first big tech company to tell us about July. In September, we should hear from CIEN and they will tell us about their views for the 2H of 2011. On September 4 2008, despite the run in T CAPEX, CIEN was one of the first companies to lower expectations based on a contraction of CAPEX. LEH declared bankruptcy ten days later. CAPEX for T in 2009 and 2010 both started from lower Q1 bases and built through the year. These were also the years of QE1 and QE2 and what I had termed the spending catch-up cycle which I now think is at a close as evidence by FFIV, STX, RVBD, etc. The red dot at the bottom right of the chart, that is where I would expect T CAPEX to start in 2012 if 2011 is a repeat of 2008 CAPEX spend. If that is the case, then forward expectations in the market are too high and CxOs have been telling us that for a few months. I still believe in product cycles and this is merely a hypothesis by me and I could easily be wrong. RVBD: RVBD will reinforce the 25-30% down rule for high multiple growth companies that miss forward expectations. RVBD also went out and purchased two companies. A few days ago I posted this about FFIV “Here is an article that says that FFIV is going to buy ALLT for $450-500M. This is somewhat interesting because the last time FFIV bought a company for $400M is was Acopia and that did not work out well. The question is why would FFIV want to spend ~5% of their market cap on ALLT? I think the answer is when growth falters, buy something quick. I could be wrong, but this assumption has proven true many times in the past. It should all be clear when FFIV reports their results and we can get management’s view as to the market TAM and growth rates.” RVBD saw weakness in EMEA and they knew that organic growth was not going to meet expectations so that is a good time to buy stuff. Just the way it works. Regarding what they purchased; Zeus could be very good for RVBD and bad for FFIV. ADCs are going to be a virtual appliance in a virtualized world so this is a good pick up for RVBD in my opinion. As for the calls to by the weakness, I think this is a multi quarter slowdown. See you in 2012. 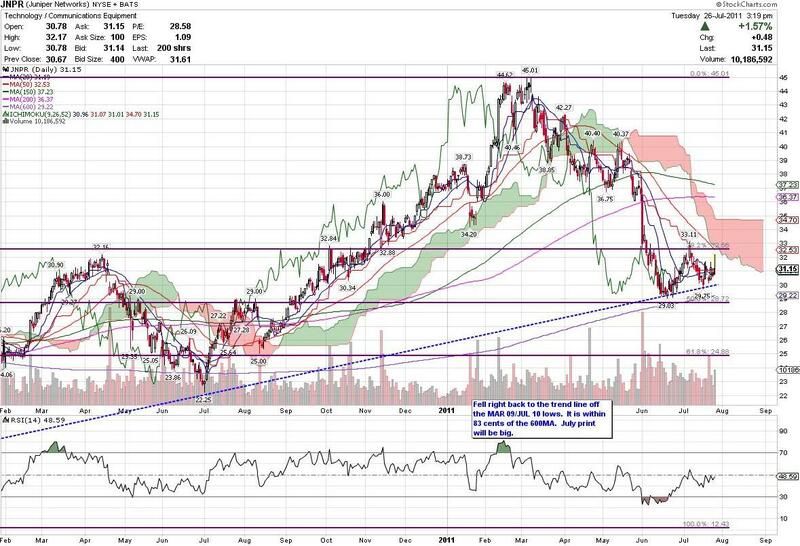 AAPL: Wow. As I wrote before the way to play the mobile device market was through AAPL, GOOG and QCOM. The most interesting analyst factoid I read this morning was from Ben Reitzes at Barclays who said that iPad quarter units sold had reached 10% of the PC market units in 15 months. In a new category class (i.e. tablets) created by AAPL, they reached 10% of quarterly PC unit volume in 15 months…that is a positive product cycle. INFN: Somewhat concerning comment from INFN last night that 10G market is competitive and they have had to provide additional discounting to protect share and win new deals. Two of INFN’s top 5 customers were MSOs. Is it me or does INFN look more like a cable equipment supplier? 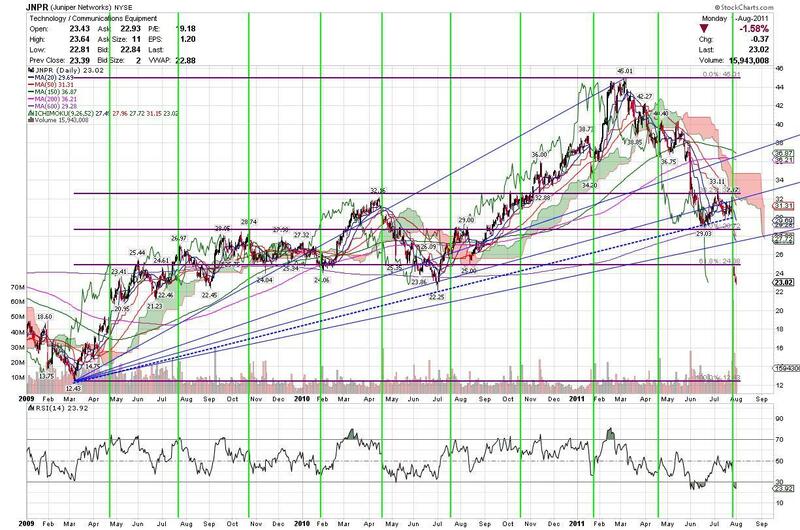 ADTN: Well off the March ’11 high and now trading in a range that it last occupied in late 2010. When I wrote about the three market dislocations I was specifically thinking about how expectations had exceeded the ability of the company to meet and that these expectations were based on lagging indicators (the problem of induction) and investors and analysts need to be careful. The evidence was clear to me: CIEN, CSCO, FNSR, IXIA, HPQ and now ADTN. I noted several sell side calls reiterating strong buys on ADTN after the miss. WBMD: Not normally a focus area for me, but when a successful subscription based web property tells the world it has a subscription and renewal problem, I pay attention. Here is another company that confirmed the 30% down rule when forward growth expectations are missed. Many more data points will emerge this week with VMW, EMC, INFN, AAPL, RVBD, EBAY, FFIV, STX, ERIC, INTC, T, VZ, MSFT, WDC and APKT earnings reports. I will be interested to look at CAPEX from the big service providers as well as the results and guidance from infrastructure suppliers. I continue to hear rumblings of a broad based CAPEX spending slowdown and budgets being pushed out. I am not sure if this is a result of European macro concerns, US budget issues or overall sluggishness in the economy, but over the next two weeks we should get enough data points to confirm or dismiss the rumblings. A number of research firms have put out positive CAPEX spending calls over the past few months, I have yet to see company results match these calls, but the data points coming in the next few days should help frame the correct answer.